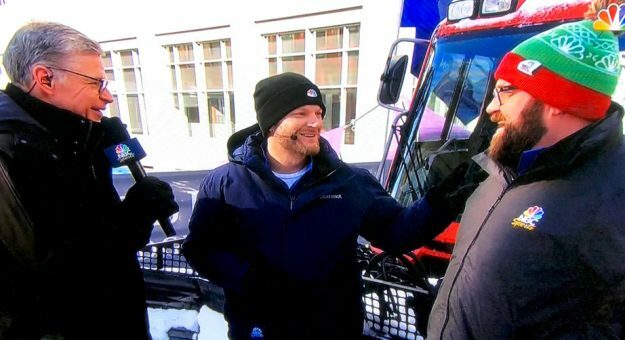 Dale Earnhardt Jr. made his broadcasting debut during NBC’s pre-game coverage of Super Bowl LII on Sunday. It’s #SuperBowlLll Sunday. Tune in to the @nbc pregame show at 1pm ET. Hope everyone enjoys the day. “I join NBC and I’m at my first Super Bowl, I can’t believe it,” Earnhardt said to fellow NASCAR on NBC broadcaster Rutledge Wood and NBC’s Dan Patrick. Wood and Earnhardt also partook in ice fishing. Reigning Monster Energy Series champion Martin Truex Jr. and Team Penske driver Ryan Blaney joined Junior during the latter portion of his coverage for a snow tubing race. Wearing a Patriots beanie, Blaney won the race over Junior and Eagles fan Truex.